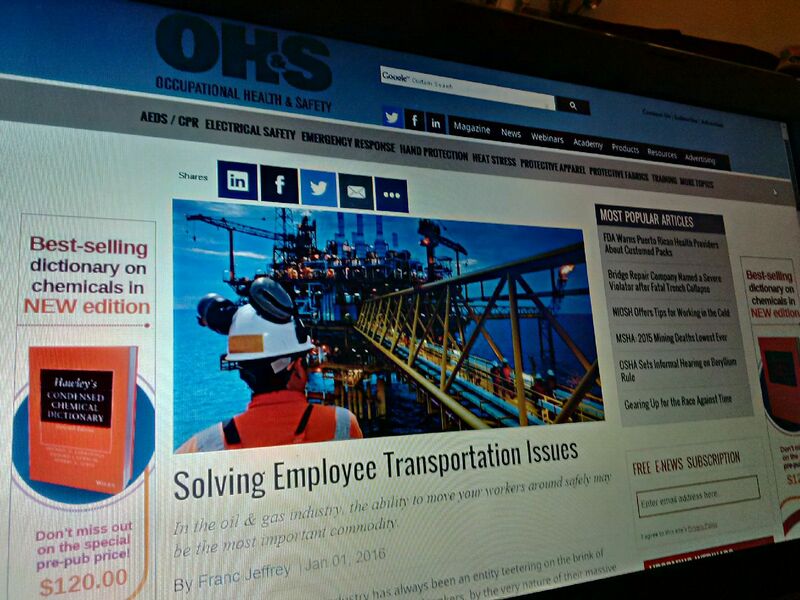 Solving Employee Transportation Issues - In the oil & gas industry, the ability to move your workers around safely may be the most important commodity. The oil, gas and marine industry has always been an entity teetering on the brink of unfortunate circumstances. Oil rigs and oil tankers, by the very nature of their massive size and exposure to the fickle whims of a relentless and unforgiving Mother Nature, are susceptible to a myriad of dangers. And when those dangers occur, the safety of the men and women manning these maritime behemoths must take top priority. According to the official Shell Oil website, the energy giant begins evacuating non-essential personnel from offshore platforms and drilling rigs beginning with sites closest to a developing hurricane’s anticipated path. So, like Shell, most of the larger oil companies have evacuation down to a science, particularly during hurricane season. In many cases, the evacuation from oil rigs or oil tankers is highly manageable; sometimes no more than a few dozen people have to be transported. This means most of the time, the evacuees can simply grab a taxi, book themselves into a hotel room, or make other similar accommodations. But what happens when the evacuation is so immense that you are suddenly relocating thousands of evacuated workers to the nearest mainland? In October 2014, with the threat of a hurricane ready to batter the Gulf of Mexico, Mexico's state oil company Pemex evacuated 15,000 workers from more than 60 platforms in the Gulf of Mexico. Think about it: 15,000 workers, forming a virtual stew of various cultures and languages and nationalities, all with the need to be transported and lodged. It's a good guess that while company officials are watching their financial lifeline being battered and starting to list badly under the wrath of 100-mile-an-hour winds, this is an extra mental burden they don't need. Anticipating worst-case scenarios is a prerequisite in the oil, gas, and marine industry. Although travel by executives at the C-suite level in these types of companies is handled with the highest priority, to handle the constant movement of lower-level workers many companies enlist the services of Travel Management Companies (TMCs). TMCs coordinate getting personnel from land to rigs, tankers, drills, and pipelines and back, a massive orchestration that includes coordinating accommodations, lodging, weather alerts, translation services, and various other types of ticketing. We once worked with a 30-person energy exploration team that had to be transported back and forth to Greenland. They needed to be brought to Edinburgh from all over the world, housed overnight at the airport, and then walked to the private charter terminal the following morning. To make the matter even more challenging, they came from more than a dozen different countries, encompassing nearly as many different languages. It was an exhausting effort over the course of a drilling season, in this case a summer, but it all came together successfully. One of the key areas of concern, as we alluded to earlier, is severe and abrupt weather, whether it’s the unpredictable Gulf of Mexico, the wave-lashing North Sea, or the harsh weather that needs to be navigated to get workers to a pipeline snaking its way across the Alaskan wilderness. Travel Management Companies have the technology to keep companies informed in real time of weather situations, to let the decision-makers know that although the weather may be favorable when a crew flies from London to Edinburgh, the same might not be true when that same crew lands in Greenland. There will always be the need to make quick changes to flights, hotels, ground transportation, and the like. And, once again, this is not something you want to deal with while your disabled company oil tanker carrying millions of gallons of oil is teetering on the edge of an environmental Armageddon. Navigating Danger Zones - There are certain industries that need to send employees to work in the world's "hot zones," such as the oil & gas industry. According to a USA Today report, in 2013 three Americans were among 38 workers killed in the siege of an Algerian gas plant in which Islamic terrorists used hostages as human shields after their attempted mass kidnapping for ransom went awry. Seven U.S. citizens survived the attack. The need to move crews swiftly isn't all at the whim of Mother Nature. Sometimes it is the political whim of where you are setting up shop, whether the sand-swept Middle East or the steamy jungles of South America. This is where you need to have real-time knowledge of the political climate of the day, the best exit points, and how to travel safely within those countries should the need to evacuate a facility arise. However, it isn't always about evacuating workers from offshore facilities, but getting them from a major airport to a remote location, perhaps where a helicopter undertakes the last leg of the trip out to the site. OGM travelers also need to realize that the flight on a major airline to get into a somewhat unstable country isn't the problem; it's traveling within the country, when they have two options to get 350 miles inland. The quickest option is to take a local small airline, which could reach their destination in about 20 minutes. However, these smaller airlines may not comply with the strict safety and service precautions applicable to Western airlines. The alternative is a seven-hour car ride, which will likely take you through a number of security checkpoints manned by people with automatic weapons. These are not easy decisions to make. Fortunately, the recent boom in technology has helped personnel travel more safely because now they can receive electronic alerts regarding risks such as natural catastrophes, labor strikes, and changes in flight schedules. Finally, a major factor involved in the decision to use a TMC is simply a case of saving money and accommodating employees. Most workers on oil rigs are able to use special pricing when booking plane tickets while working offshore, often as much as a 50 percent discount, with the added caveat of being allowed great flexibility in changing flights with minimum financial setback. However, these hefty discounts can be put in place only by an accredited Travel Management Company that also monitors the fluidity of ticket pricing and flight scheduling. This is key to any company whose business depends on the assurance that its crew will be able to travel unabated to and from various locations. There is the potential for a myriad of problems to arise when operating these marine locations, both weather-related and man-made. And the cost of finding solutions to these situations can often be crippling and costly to a business, both in terms of valuable staff time wasted and in the difficulty in finding the time or the resources to source viable, inexpensive travel alternatives. A Travel Management Company can monitor global weather conditions and political uncertainty, then respond quickly when major disruptions to travel occur, ensuring all employees make it to their destination or can be evacuated as quickly and safely as possible.